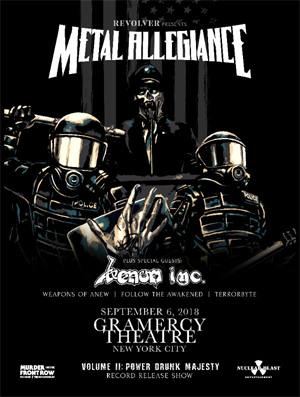 METAL ALLEGIANCE Release Second Single "Voodoo Of The Godsend"
The band has released its second single, "Voodoo Of The Godsend" featuring Max Cavalera. Watch the lyric video below. Alex Skolnick comments, "One of the most distinct tracks on our new album (and indeed, in the entire MA catalogue), "Voodoo" has a hypnotic feel with indigenous percussion, bringing to mind a ritual in the rainforest. We’re grateful to have the ultimate voice for this track, with a sound that’ll ll never be mistaken for anyone else: Max Cavalera."